We hold regular charity bake sales in our team at work, and trial and error has taught me that this cake goes fast! It’s really does seem to be one of the best sellers. 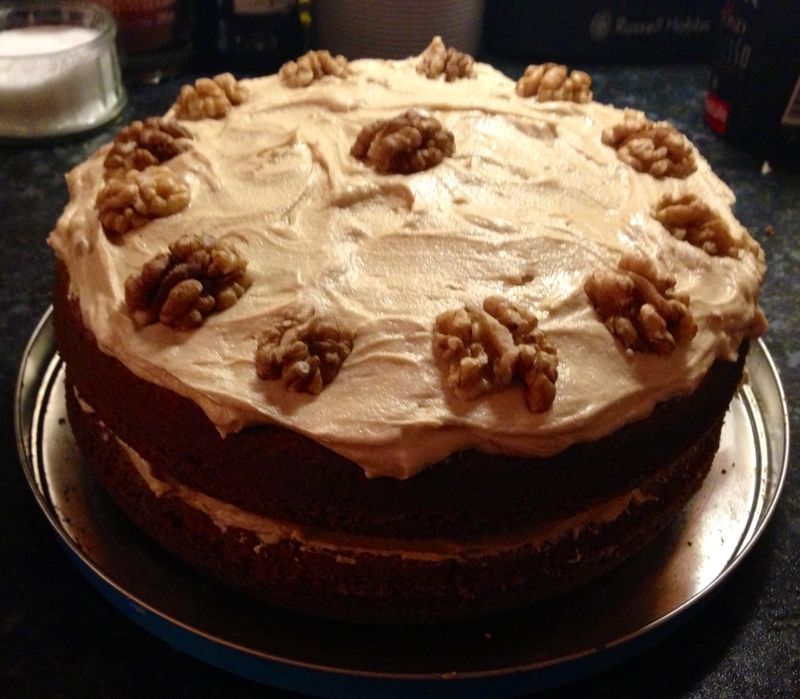 In fact, I baked this last night to be sold today…and within 20 mins of the sale someone bought the whole cake. THE WHOLE CAKE! (It was for someone’s birthday just in case you’re concerned about their general well-being) . And if you needed any more convincing, Paul doesn’t like nuts but somehow loves this cake. It is one of the easiest cakes to make, and whilst the nutty flavour is quite subtle, the espresso really makes this cake sing. The buttercream frosting is really simple too, but really adds to the overall taste! (I’m not really an icing fan, but this converted me to the idea). The first time I made this I couldn’t get espresso powder, but I really would advise searching it out. I found a Percol espresso powder at the supermarket which I now use, but Nescafe also do one that’s quite widely available too. This cake is from Nigella Lawson’s book, Kitchen, which is actually one of my favourite Nigella books. And whilst I’ve listed the recipe below, it’s also available online on her website here. Butter 2 20cm/8” sandwich tins and line the base of each with baking parchment. Dissolve the instant espresso powder in 1 tablespoon boiling water and add it while still hot to the processor, pulsing to blend into the buttercream. (If you are doing this by hand, sieve the icing sugar and beat it into the butter with a wooden spoon. Then beat in the hot coffee liquid). Categories: Cakes & Baking, Reidbury Recipes | Tags: Cake, Cakes & Baking, Desserts, Kitchen, Nigella Lawson | Permalink.